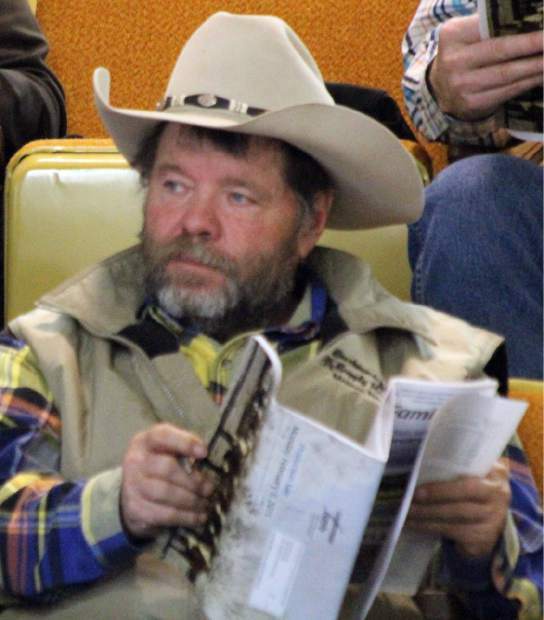 Duane Keller, New Salem, N.D., got some bred heifers at the Logterman Family Annual production sale. 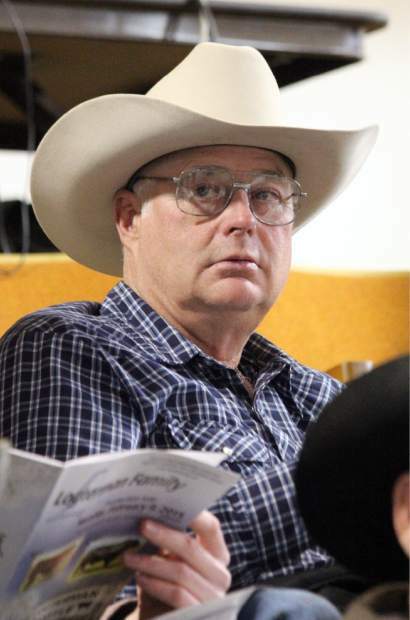 Bob Simons, Cody, Nebraska, purchased Logterman family bulls. 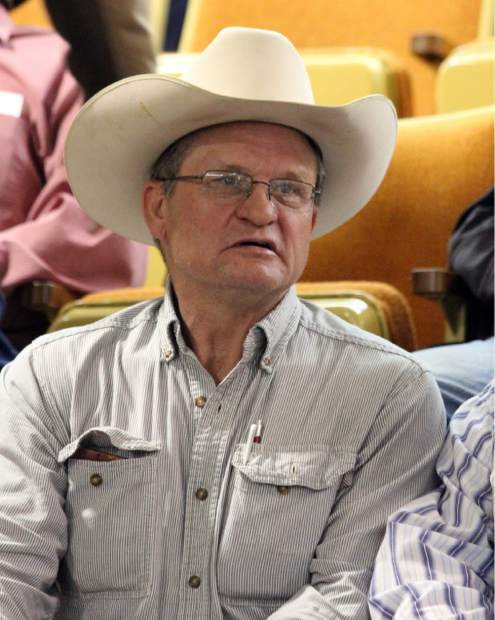 Merle Temple, Porcupine, S.D., purchased Angus and Hereford bulls at the Logterman Family sale. The Logterman family, brothers Dwight and LeRoy, and their families have built their reputation on selling range-ready Hereford and Angus bulls at their annual production sale. This year was no exception. The bulls presented at their Feb. 9 sale in Valentine, Nebraska, were in great condition, not overly fed and will stay sound in the breeding pastures for several seasons. A sure sign of a program that works is the attendance of repeat buyers, and the seats were full of repeat buyers for this sale. The two-year-old Angus bulls were primarily April and May 2013 bulls born on the South Dakota ranch. The yearling Angus bulls are primarily January- and February-born on the Montana ranch and hand-selected to sell as yearlings. The two-year-old Angus and the two-year-old Hereford bulls had specifically been developed to sell as 2-year-olds and none had been offered for sale in the past. The bulls were eagerly bid on by the large crowd of buyers on hand giving the Logterman Family their best sale to date. Lot 402, LLL Hero 6017 402, a Jan. 6, 2014, son of DFA Hero 6017 and out of a VDAR Really Windy 4097 daughter. This calving ease bull had a moderate 71 pound birthweight and weaned off at 747 pounds with epds of BW -1.2 WW 55 Milk 18 YW 86. Merle Temple, Porcupine, S.D., was the buyer at $11,000. Temple also got lot 406, LLL Hero 6017 406 for $10,500. This bull is a three-quarter brother to the lot 402 bull, and also had a moderate birthwieght of 79 pounds, weaned off the cow at 779 pounds with epds of BW -0.3 WW 55 Milk 19 YW 86. Selling at $10,000 was lot 3053, DL 4047 Royal Duke 3053. This two-year-old March 2013, son of VDAR Royal Duke 4047 had a weaning wt. of 726 pounds and epds of BW 3.8 WW 52 Milk 24 YW 90. Kime Ranch, Valentine, Nebraska, was the buyer. Topping the Hereford bulls was lot 3152, L=Freckles 3152 is a April 2013 son of KC MR Ribstone 10071 with a weaning ratio of 103, yearling ratio of 103 and epds of BW 0.8 WW 47 YW 80 Milk 29 M&G 53. Wolfenden Herefords, Valentine, Nebraska, was the buyer at $15,000. Wolfenden Herefords also purchased lot 3145, L=5216 Domino 3154 for $10,500. This April 2013 son of UPS Domino 5216 had a yearling ratio of 108, rib eye ratio of 115 and epds of BW 1.2 WW 44 YW 74 Milk 27 M&G 49. Selling at $9,250 was lot 3139, L=Domino 3139, an April 2013 son of UPS Domino 5216 with epds of BW 2.9 WW 51 YW 90 Milk 28 M&G 54. This bull also had a weaning ratio of 102, yearling ratio of 107 and rib eye ratio of 112. Steve and Amy Nuhsbaumer, Zell, S.D., were the buyers.